Hello, friends!! I’m so excited to be partnering with Rocksbox and sharing my first Rocksbox review along with a coupon code for your first month free! 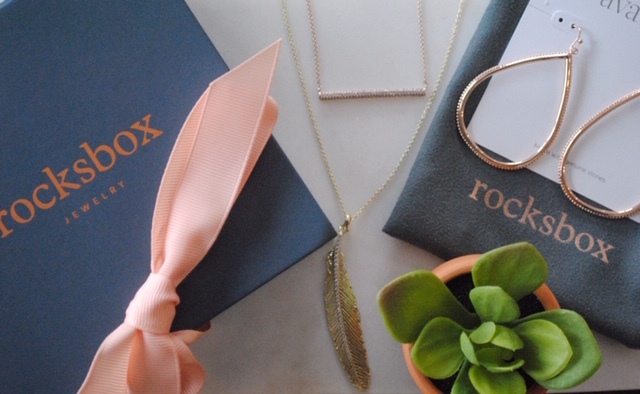 Rocksbox is a jewelry subscription box service. 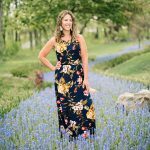 It’s similar to other subscription services (like Stitch Fix) where a personal stylist picks out pieces for you to try in the comfort of your own home. But what sets Rocksbox apart from the rest, is it’s option to rent. First, sign up for Rocksbox. Use code mamainthemidstxoxo to get your first month free. Should you choose to continue using Rocksbox, you pay $21 per month for the subscription. Next, fill out your style profile answering specific questions regarding all your jewelry preferences: likes, dislikes, special needs, style, colors, etc. Then complete your wish list. Creating a wish list of specific pieces gives your stylist a very clear idea of exact pieces and styles you are drawn to. Your stylist then tries to select pieces directly from your list as well as similar styles. I placed the recommended 30 pieces to my list, and received two items directly from the list in my first box. Next, you will receive an e mail from Rocksbox letting you preview the items selected for your box. You then have the option to swap any piece out that does not fit your particular needs (i.e. don’t like it, have something similar, wrong color, etc.). Rocksbox will then send you your box of jewelry. You have two choices for your jewelry: buy or rent. If you love a piece, you may choose to buy it. In which case, your $21 monthly subscription fee will be counted toward the purchase price of the jewelry. Should you choose to buy all 3 pieces, you will get an additional $10 off your order. You may also choose to rent the pieces. In this case, you can then keep the pieces to wear as long as you like. Whenever you are ready for a new set, simply send the pieces back in your prepaid envelope, update your wish list, and you will receive your next set. You may receive boxes as little or as often as you like with no additional fees. Your $21 monthly fee covers the rental fee and all shipping. I received 3 pieces of jewelry in my first Rocksbox. Ava Rose Savannah Hoops for $46. These beautiful rose gold teardrop hoop earrings were perfect for my style. They were beautiful, light weight, and had great detailing along the sides. While I loved these, I already own gold leather teardrop earrings, so felt these were, too similar to invest in. I chose to keep and wear for a bit before I return for my next box. Sophie Harper Micro Pave Bar Pendant for $51. This piece came directly from my wish list. I really loved the simplicity of this rose gold bar necklace. The bar had small, subtle stones within the bar. It fits close to the neck and is a piece that can go with anything. It can be both layered with other necklaces or stand alone. I loved the versatility of the piece and chose to use my $21 monthly subscription fee toward this piece. Aster Pluma Long Pendant for $51. This gold necklace was also on my wish list. I really wanted to try a long necklace, and love the feather trend. It was a very cute, but not 100% my style. It was not enough for me to buy, but love that I can wear it a few times before I choose to return it! Rocksbox is a really neat subscription services that allows you to try out pieces without the pressure to buy. It allows you to test drive pieces, wear something different for special occasions, indulge in a trend, and keep your jewelry selection fresh and current without having to replace your whole collection. Cancel after your first free month if you’re not satisfied in anyway, or continue the subscription to receive unlimited jewelry boxes. Mama in the Midst contains affiliate links. Thank you for clicking around my site! I appreciate you! All opinions on this page are mine. Good to know! 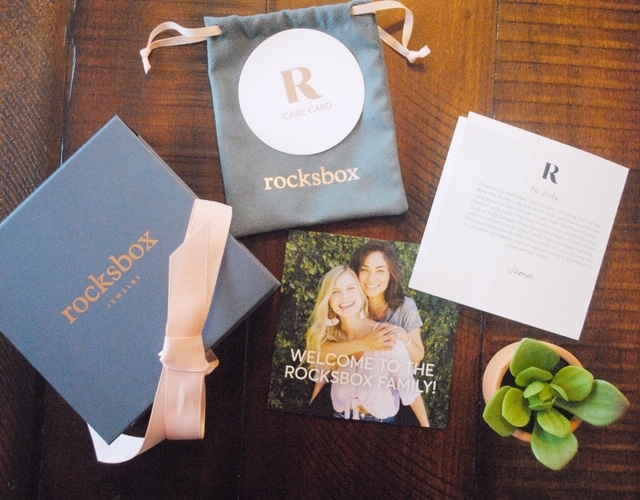 I’ve always wondered about Rocksbox — and thanks for the great coupon code! I actually couldn’t believe I hadn’t heard about it in one of your great reviews!! You are such a awesome reviewer of all the boxes! !